Best Kitchen Products at Taste Stop! Most people don’t realize how much they need the best japanese rice cooker until they actually get one. I’m one of those people who has a tendency to burn rice all the time. I never get the rice to water ratio right. I get impatient and I turn the heat up too high. I wind up with rice soup, or rice burnt to the bottom of the pot. I’ve gotten so frustrated with burnt rice that I’ve thrown pots away, because it takes forever to scrub them. That’s why I set out to find the best Japanese rice cooker. I’m really glad I finally caved and invested in a Japanese rice cooker. At first, it seemed kind of foolish to invest in an appliance that seems to only do one thing, but rice is perfect for any kind of food that needs to absorb water. I steam my vegetables in my rice cooker, and I also use it to make oatmeal, hard boiled eggs, and soup with lentils, rice, or barley in it. Before I knew it, I found myself reaching for my best japanese rice cooker a few times a week. I’ve experimented with a lot of rice cookers, and I’ve compiled a list of my favorites. If you’re looking to get the best Japanese rice cooker and make your life a little easier, I can personally vouch for all of these. At first glance, I thought the Zojirushi rice cooker looked a little too high tech for me. As it would turn out, it’s so easy that any idiot can use it. I’m one of those idiots. I’m far from a professional chef, and I really like the fact that the Zojirushi is highly programmable. You get options for the rice texture, as well as a specific option for different kinds of rice or porridge. I don’t have to think about anything when I use it – I can turn it on and start cooking the rest of the meal, and I don’t really need to check on it. It plays a little song when it’s done working, and all I do is fluff up the rice and either take it out, or keep it on the warm setting if I’m not ready to eat yet. 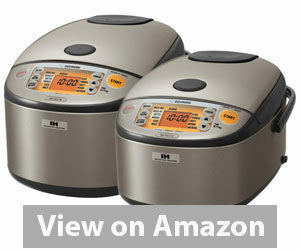 This specific Japanese rice cooker is programmed with a special setting, called the GABA brown setting for brown rice. Brown rice has a compound called gamma-aminobutyric acid that’s healthy for your heart and your kidneys, but it’s only released at certain temperatures. This setting gives brown rice an extra health boost, and the rice still tastes the same when it’s done. It might sound kind of silly, but I really like the little accessory that comes with this Japanese rice cooker that works as a spoon holder. It keeps me from getting rice starch on my counter, and I don’t have to remember to grab a spoon when I want to serve the rice. This is the perfect rice cooker for people who eat a lot of Asian food. It’s inspired me to make more curry, and it makes sushi rice really easy. It can’t help me roll the sushi, but everything else is amazingly easier with this Japanese rice cooker. This is a programmable unit that’s similar to the Zojirushi rice cooker, but it’s a little simpler. It also costs a little less to help make up the difference. It comes with additional options for Jasmine rice, brown rice, porridge, and oatmeal, so it’s designed to perfectly cook more than just your average rice. One of the things I appreciate the most about this rice cooker is how easy it is to take apart. If you want to thoroughly wash everything, even the lid pops out to make washing simple. The 5.5 cup model, which is the one I have, is the perfect size when you’re making dinner for just a few people, or if you want to prep a few servings of rice for lunches throughout the week. That’s what I use it for. Another thing that makes this Japanese rice cooker so great is the “quick” setting. Because the capacity is somewhat small, the quick setting really does make rice fast. When I’m really hungry and I want to eat right away, I have a tendency to reach for this rice cooker. I’m not very patient on an empty stomach, and this rice cooker seems to understand me. Overall, I would say that this Japanese rice cooker does a great job at keeping everything simple. I haven’t used it to cook anything other than rice or oatmeal, but it’s great at what it does. It’s optimized for last minute meals, and as someone who is generally pretty busy, I appreciate the fact that I can whip it out and get to work really quick. If you just want a simple induction rice cooker, this is the one. There’s nothing complicated about it. It has the quality of most Japanese rice cookers that use induction technology, and it isn’t fancy. This one is a no-brainer for people who just want good rice, period. I’ll admit that I was a little intimidated by the COSORI cooker at first. It looks like something an astronaut would use. It’s more than just a rice cooker. It’s a combo small appliance that can be used as a pressure cooker, a rice cooker, a steamer, a sauté pan – almost anything but a flying car. It’s on the bigger side as small as tabletop appliances go, but that’s because it’s an 8 in 1 tool. 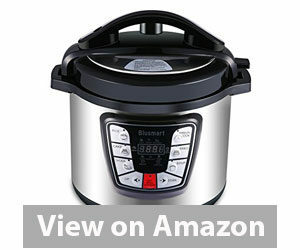 This can also be used as a slow cooker, replacing most of the functions of a Crock Pot. You can even use it as a yogurt maker because it has settings for pasteurizing. I’m not patient enough to try to make my own yogurt with it when I can just by a tub of plain yogurt at the store, but for people who prefer organic yogurt with specific cultures, this multi-cooker might solve an important need. All the control on this are automatic. It monitors its own pressure and watches its own temperature. If you want your food to cook while you’re mowing the lawn or doing the laundry, you don’t have to worry about a potential fire hazard in your kitchen. I’m absent minded sometimes, so I appreciate that this cooker has my back. The reason I love this cooker so much is because I feel like I got the most for my money. It’s great at cooking rice, but it’s just as good at making chili or beef stew. I love eating, but I’m a really lazy cook. I really like that I can throw everything in the pot and let the pot be the chef. This is one of the best values you’re ever going to find. If you would rather have one appliance that does absolutely everything instead of a bunch of small specialty appliances, get this cooker. It saves you money in the long run, and it’s great for people (especially college students or apartment sharers) who don’t have the space to store a bunch of small gadgets. This one looks a lot like the traditional rice cookers you might find at a normal budget department store, but it’s massive. It’s a commercial sized rice cooker, and it’s perfect for people who have a large family to feed. It has a very industrial appearance to it. It’s definitely not intimidating. It’s kind of utilitarian in design. At first I was worried I wouldn’t like it because it doesn’t have the same kind of gadgets and functions as a lot of my other rice cookers, but this one really delivers. This rice cooker has two settings – on and off. You can’t program it, and it doesn’t have optimized settings for different kinds of rice like most Japanese rice cookers do. You put in the rice, you turn it on, and you wait. It’s one temperature, and you cook by pressing a single button. The biggest draw to this rice cooker is the sheer volume it can cook in a single go. You can put up to 23 cups of dry rice in it. When all is said and done, you wind up with 46 cups of finished rice. That’s almost three gallons of rice. It’s almost absurd how much you can make. If you’re a caterer, a small restaurant owner, or a member of a huge family, this is one of few rice cookers that can handle such a high volume. I haven’t had a reason to cook 23 cups of rice in it, but I did cook a dozen cups of rice for a family dinner. Everything came out perfect, and I loved the fact that I didn’t need to make two batches to feed everybody. If you want a rice cooker for a business venture, this is the one you want. It was clearly designed with caterers and the restaurant business in mind. If you have a huge family that eats a lot of rice with meals, it might save you time when the holidays roll around or there’s a special occasion when everyone is going to gather to share a meal together. This is a very compact pressure cooker, and it’s also very affordable. I didn’t have high expectations for it when I got it, but I find myself reaching for it surprisingly often. 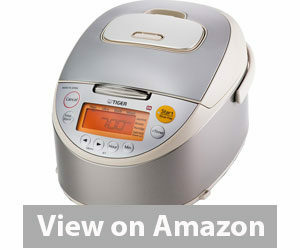 It’s a rice cooker, pressure cooker, deep fryer, steamer, slow cooker, and you can even make a cake in it. It doesn’t take up too much space for everything that it does. If you have a tiny kitchen or you’re living in a dorm room, I’d imagine this would be perfect for you. I have used this to make rice, vegetable soup, and French fries. The size of this is awesome for frying up potatoes. It’s got a 6 quart capacity, so the sides of the fries get crisped up evenly. That’s what I was most surprised about – how much I love the fries I make in my rice cooker. Who would have thought? I’ve also discovered that this particular pressure cooker is awesome for rice noodles. If you like to make ramen, Soba or Udon noodles, this pot is the best. You can throw in the noodles with the broth, some Asian spices and some veggies and forget about it for a little while. When you come back, you have a cheap and easy meal. It’s the compact size coupled with the versatility of this cooker that make it a favorite for me. It’s such a neat little gadget, and every household would have a use for it. You can’t go wrong, especially when you’re on a budget. This cooker delivers everything you could ever need. Rice cookers are a specialty appliance. It’s not the same as buying a microwave or a stockpot, where they all usually do the same thing. Rice cookers are designed with some very specific features in mind, and you don’t know what it is that they do so differently, you might not know how to choose the best Japanese rice cooker for you. What is The Difference Between a Rice Cooker and a Crock Pot? How Many Watts is a Rice Cooker and What’s The Voltage? Why Are Regular Rice Cookers Different From Japanese Style Rice Cookers? Do I Need a Fancy Rice Cooker or a Simple Rice Cooker? How Do You Clean a Rice Cooker? What Do The Textures on Rice Cookers Mean? How Much Does a Decent Rice Cooker Cost? Cooking rice involves a lot of specific ratios that all depend on the kind of rice you’re cooking and how firm (or soft) you want it. For ideal water absorption and retention of nutritional content rice needs to be cooked evenly and at certain specific temperatures. This sounds really complicated and technical, but it’s not as overwhelming as it looks. Basically, a rice cooker is an appliance that’s designed specifically to cook rice perfectly without burning it or making it too soggy. Those are both common problems when rice is cooking on a stove, where it requires a lot of attention. You just put your rice in your rice cooker with the recommended amount of water, turn it on, and let the machine do what it does best. There is some overlap in the way that rice cookers and crock pots work. Technically, you can make anything that requires water or broth in a rice cooker. You can do the same in a crock pot, but the appliances heat differently. Crock pots, or any slow cookers for that matter, work by preserving and circulating low amounts of heat over a longer period of time. This leaves meat tender and infuses flavors more thoroughly. In general, rice cookers will cook a little faster than a crock pot. They allow steam to escape, encouraging the absorption and the evaporation of water to make rice fluffy. If you try to cook rice in a regular slow cooker, especially one that isn’t programmable specifically for rice, you might find that it turns very mushy, kind of like mashed potatoes. This is because the way both appliances deal with heat circulation and moisture are drastically different. 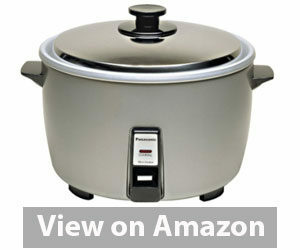 If you want a rice cooker that can also be used as a slow cooker, you need to find a versatile, programmable unit. I reviewed a few of my favorites above if you’re looking for something that will work double duty. Rice cookers come in different wattages. About 700 watts is the average, but it doesn’t use 700 watts the entire time. Once it’s done cooking and it’s resting in warming mode, it’s using about 45 watts at most. Remember to turn your rice cooker off (and unplug it) when you’re done using it. In the United States, rice cookers use anywhere between 110 and 120 volts. For people living in most other countries, you’ve going to need an adapter. If you plug a 110 volt rice cooker into a 220 volt outlet, you’re going to fry the rice cooker before you ever have a chance to use it. Get the 220 adapter. Japanese rice cookers are designed differently. Rice is an important staple in the Japanese diet, making it a no brainer to purchase a specific appliance for preparing family sized portions of rice. Japanese rice cookers often look like tiny boxes, rather than the pot style rice cookers you’d find at most American retail outlets. Japanese rice cookers are slightly more focused on specific kinds of rice. They’re very dedicated appliances, and they’re less likely to be multipurpose than other kinds of rice cookers. Some rice cookers can be used to make things like soup or stew or chili. It’s not a good idea to make those things in a Japanese style rice cooker, because the settings are so specific for rice. Out of all rice cooker features, one is easily the most important. You need a rice cooker to be nonstick. Rice is naturally sticky. It’s full of starches that break down, and when they do, they can develop a gummy texture. If the pot of your rice cooker isn’t non-stick, this can make it really difficult to clean. Everything will gunk up to the sides, and it will be hard to serve the rice without having to scrape it out in large clumps. A lot of people will benefit from automatic programming features. They’re ideal for people who don’t like to stand in the kitchen the whole time they’re cooking. If you find that you’re always busy, you’re going to want a rice cooker that can be set to the specifics you want. When it’s done, it will automatically switch to warming mode to keep you from burning the rice. Some rice cookers describe themselves as having fuzzy logic. This makes it sound like they can’t think clearly, but it actually means the opposite. Fuzzy logic just means that the rice cooker itself has some computer components inside of it that handle basic processing tasks. From a tech perspective, they’re more like smartphones than a laptop. The fuzzy logic will detect temperature and keep track of time. It can make slow and deliberate adjustments to help your food cook in an optimized way. It knows if it’s getting too hot, and it knows if it isn’t hot enough. It corrects its own mistakes and makes the adjustments you would otherwise have to make on your own. Only highly programmable rice cookers need fuzzy logic. The ones that just have an on/off switch don’t need it. Simple rice cookers are often cheaper, and they really only do one thing. They’ll cook rice according to package directions. You can’t change the texture of the rice, and they won’t do any of the work automatically. You need to check the rice and make sure you get there on time to turn it off. If you really only need something that can cook plain white or brown rice and save you a burner on your stove, a simple rice cooker will do the job. A lot of people prefer fancy rice cookers or multifunctional appliances because they replace multiple things. 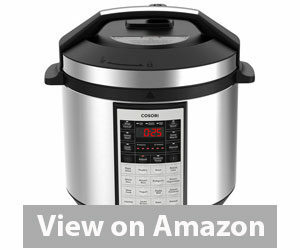 There are a lot of pressure cookers designed for slow cooking and rice cooking, eliminating the need for a crock pot or even a Dutch oven in some cases. If you need multiple kitchen appliances, you’re better off getting a fancy rice cooker than can replace most of them. You save money in the long run and the technology they use can even help you save time. How you clean your rice cooker depends on the model you have. Simple rice cookers are really easy to clean. You just take the pot out and wash it. Some of those pots have a nonstick coating that will get completely ruined in the dishwasher, so read the instructions to figure out whether or not it’s dishwasher safe. Don’t be lazy and throw it in the dishwasher without checking – you can wind up ruining it, and it’s easy to wash by hand anyway. Induction rice cookers are a little different. They have plates you need to remove and wash. Some pressure cooker style rice cookers have gaskets you need to remove. This is one of those instances where you shouldn’t act proud and throw the instructions away. You might want to keep them around for a little while. They’ll tell you how to take it apart, clean it, and put it back together. After you’ve done it a few times, you probably won’t need to check the booklet anymore. Though it might go without saying, someone who doesn’t know any better could inadvertently ruin their rice cooker. The part of the rice cooker with the heating elements isn’t waterproof. If you get it wet, you’ll ruin the appliance. You’re better off wiping it down with a dry cloth if it should somehow get dirty. Never submerge the heating units. Rice cookers come in all different capacities, usually measured in liters or cups. Japanese models are more likely to use liters, while their American counterparts stick to cups. The capacity listed is usually the amount of dry rice, meaning that the capacity doubles once the rice is cooked. A five cup rice cooker actually makes ten cups of cooked rice, so don’t get confused and buy one that’s twice as big as you need. Larger families generally do better with larger rice cookers. If you like to cook for events (or if perhaps you are a caterer) you’ll want a larger capacity cooker. You can use it to make smaller personal servings when you’re making dinner for yourself or fill it all the way up when you have a ton of mouths to feed. People who simplify their lives with meal prep will also do better with larger capacity rice cookers. You’ll be making more than one meal – most preppers will need enough rice for a week. Rice cookers that are more than just rice cookers often come with multiple attachments. For example, multipurpose cookers will sometimes come with deep frying baskets, because they can be used with hot oils. Regular rice cookers can’t, and in fact, trying to do it might ruin your cooker. Some rice cookers come with steamer baskets that can be used to cook vegetables. If you’re trying to eat healthy, steaming vegetables will preserve their nutritional content. It also eliminates the need to use fats (such as butter) when cooking. It retains more flavor and texture than boiling vegetables. Some rice cookers already come with steaming trays. If the one you want doesn’t, you can probably find a general fit steam tray or a standalone accessory that the same brand makes. High tech rice cookers will feature several texture settings. There’s usually firm, regular, and soft, but some also include sushi rice. Sushi rice is a special texture. It needs to be sticky enough to hold together, and you’ll probably need to add special vinegar while you’re cooking sushi textured rice. Firm rice is a little better when you’re making fried rice. It’s heartier, and it won’t be overcooked by the time it’s done. Regular rice is exactly what it sounds like. It’s easy to chew and it won’t squash down easily. Soft rice does squash down if you press it with the back of a spoon. A lot of people prefer soft rice for desserts like rice pudding. There are very basic rice cookers that are incredibly inexpensive. They only have one function, and they’re not particularly good for anything but cooking medium rice with a lot of supervision. Automated and programmable rice cookers can range anywhere between $75 and $250. When you put that price into perspective, it’s not as expensive as it might seem at first. The higher end models usually do a lot more than just cook rice, so you’re not paying more for the same function – you’re paying more for everything else it can do. A good rice cooker is similar in price to a cheap microwave, and it actually does more than a microwave can. Short of making popcorn and defrosting frozen food, a great rice cooker will actually give a microwave a run for its reputation. I probably know more about rice cookers than most sane people know. I feel like I’ve tried about a million of the things, and I’ve found so many ways to use them that they’ve become a part of my everyday life in the kitchen. I love each one of these rice cookers for a different reason, and you’re bound to find the perfect one for you somewhere on my list. Happy shopping! If there are two things I love more than anything else in the world, it’s a great glass of wine and something fun to do in my kitchen. I’ve had a lot of adventures and a lot of misadventures – please learn from my mistakes and take my advice when I have it to offer. I’m always in my kitchen trying out new things, and I want to share them with you. 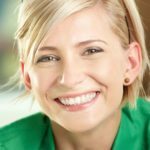 TasteStop.com is designed to be your one stop shop for all things relating to cooking and wine, two of the finest things in life. I showcase reviews of the things that I’ve tried, for better or for worse, and I want you to join the experience with me. Let me test things before you buy them.